See the real India while floating down the backwater of Alappuzha by houseboat in this authentic and innovative excursion. 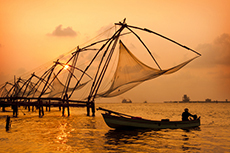 Take a guided tour through the city of Kochi—formerly Cochin—and enjoy the full range of this important Indian port city. The "Queen of the Arabian Sea" is believed to be the finest natural harbor in the world with its man-made islands and lush plants scattering the water's edge. See this and more on a Kochi Harbor Cruise. 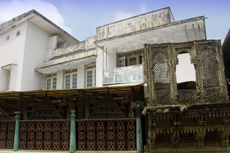 Founded in 1568, the Paradesi Synagogue is the oldest synagogue in India; it features a highly decorative interior bursting with local culture. 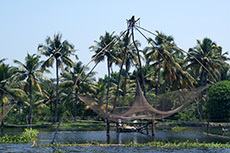 Kumbalangi Village, on an island in Vembanad Lake, is noted for its friendly locals and pristine surroundings. 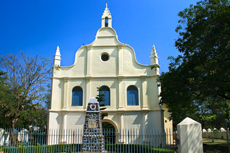 Visit St. Francis Church, India's oldest European Church, built by the Portuguese Franciscan Friars. Though his remains were later taken back to Portugal, Vasco da Gama was once buried here. Backwater Cruises: A houseboat tour, typically in a thatched-roof wooden barge, past coconut palms, rice paddies, small villages and Chinese-style fishing nets along Kerala's lagoons, lakes and canals is a relaxing way to see local life. Ideally, it's a multiday journey where you sleep on your houseboat and eat Kerala food prepared by your chef, since houseboats leave from Alappuzha (Alleppey), a one-hour or more drive south of Kochi. 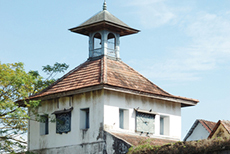 But, full-day or even half-day boat and canoe village cruises from Kochi are available.